Pipes are structures that are in constant use from the disposal of wastewater from your toilet or garbage disposal to delivering water to your shower or garden hose. This means that it is important for home or business owners in Five Mile Prairie to check to see when their pipes could need repair or replacing. When your pipes are not working right, it can be hard to tell if it is a small problem that can be fixed with hydro jetting or a large problem that requires pipe bursting. When it comes to pipe replacement, most people assume that it has to be a damaging and invasive process where drainage pipes are dug-up and replaced costing a home or business owner thousands of dollars. 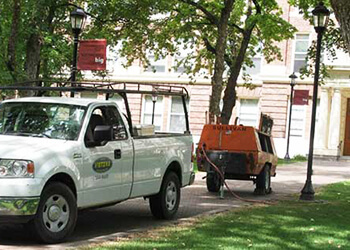 At Vietzke Trenchless, we specialize in trenchless pipe bursting making your pipe replacement needs easy and affordable. The constant use of pipes can create severe build-up and deterioration within your pipes. When build-up calcifies, and breaks in your pipes occur, this means that trenchless repair is no longer an option, but trenchless replacement can come to the rescue. To establish that your pipes are blocked and broken, we perform a simple and easy sewer camera inspection. This involves a high definition camera being inserted into your existing pipes through a single-entry point, so that a Vietzke Trenchless technician can see in real-time what is causing problems in your drainage system. Pipe bursting is a smooth and effective process where a bursting head travels through the existing pipe, shattering it as is moves through and pushing it outward to make room for a brand-new pipe being pulled behind it. Pipe bursting will cause no damage to your Five Mile Prairie property because it only involves two small pits to be dug at the entrance and exit points where the pipe needs to be replaced. Drainage system replacement can be a smooth process, let us help you with your broken or clogged pipes!